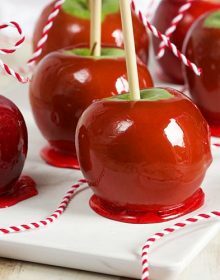 Fall calls for these easy candy apples made from scratch! Insert a stick into the stem end of the apple pushing about halfway through and set aside. Line a baking sheet with parchment paper and coat generously with cooking spray. In a large saucepan over high heat, stir together the sugar, syrup and water. Bring the mixture to a boil and turn the heat to medium. Stir in the food coloring. Insert a candy thermometer and continue to boil until the mixture reaches Hard Crack stage (from 300-310 degrees), approximately 15-20 minutes. Remove the sugar mixture from the heat and quickly dip the apples in the sugar mixture turning to coat. Transfer to the baking sheet to cool completely. Apples can be made up to two days in advance and stored at room temperature.